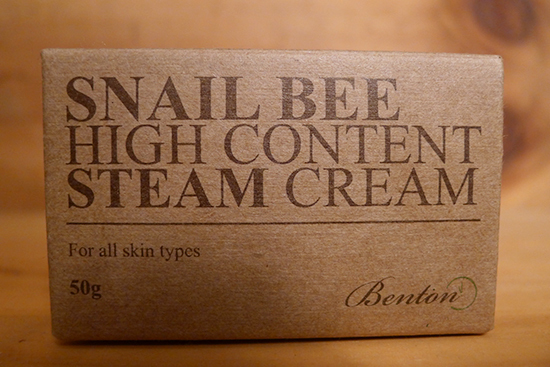 I’m only 19 days into using Benton Snail Bee Steam Cream, and I’m already itching to gush about it. I normally like to use a skincare product for at least 28 days before I review it, but, like the rest of the Benton line, the results have been so dramatic so quickly, I’m having a really a hard time keeping it to myself! This moisturizing cream has already managed to reach HG status for me, and has become part of my official baseline skincare routine. 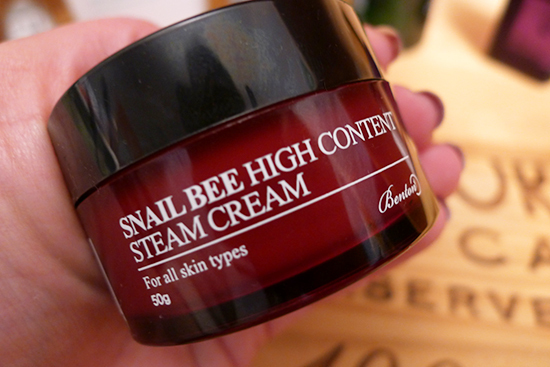 Benton Snail Bee High Content Steam Cream ($22) is a moisturizing cream from my favorite Korean skincare company, Benton Cosmetic. The term “steam cream” describes the process by which the cream is made – the idea is that high-temperature steam is injected as the ingredients are being mixed in order to better facilitate the way the ingredients work together. The steam injection process also contributes to the creamy texture of the final product. This cream is said to be good for sensitive skin, and promises to help with acne, dry skin, and oily skin, in addition to whitening/evening skin tone, and reducing the signs of aging. The notable absence of fillers and stellar skincare actives in this ingredient list has become a hallmark of Benton skincare products. One of the reasons I was excited to try this cream is that I have recently developed a sensitivity to certain amounts of Cetyl Alcohol and Cetearyl Alcohol, both fatty alcohols. In their pure form, they’re white, waxy substances. As skincare ingredients, they are found in high amounts in a majority of moisturizing creams because of their emollient and emulsifying properties. Unfortunately, they are also common irritants and acne triggers for many acne prone people, including myself. Benton Snail Bee High Content Steam Cream does not contain Cetyl Alcohol or straight Cetearyl Alcohol. Instead, it uses a combination of Cetearyl Olivate and Sorbitan Olivate. Cetearyl Olivate is a derivative of Cetearyl Alcohol and fatty acids derived from olive oil, while Sorbitan Olivate is derived from Sorbitol and olive oil. While Cetearyl Alcohol is still present as part of the Cetearyl Olivate ingredient, in this form it is much, much milder and far less likely to trigger any acne events. In fact, neither Cetearyl Olivate nor Sorbitan Olivate rank at all as acne triggers or irritants according to COSDNA, as opposed to Cetearyl Alcohol, which scores a whopping 4 out of 5 as a potential acne trigger, and a 3 out of 5 as a possible irritant. Urea – First, let’s get the gross news out of the way: urea is a primary component of urine. But don’t start vomiting yet! The urea contained in skincare products like this one is actually synthetic, which means there is no pee in this, or any other face cream. Phew! The thing about urea is that it’s actually a fantastic skincare active because of its antimicrobial and water-binding properties. Urea acts as humectant, attracting water to the skin and retaining moisture, making it a common ingredient in creams used to treat skin conditions such as eczema and psoriasis. Urea is an effective exfoliant, and additionally, it improves product penetration and strengthens the skin barrier, building resistance against potential irritants. Human Ogliopeptide-1 – Often called EGF (an acronym for Epidermal Growth Factor) in skincare products, Ogliopeptides are molecules that are used in medicine to help treat wounds and burns, assisting in the regrowth of skin. They work by increasing cell growth, and in addition to helping with cell and blood vessel growth, they also play a role in collagen and elastin production. I had a hard time locating any studies that are specifically focused on Ogliopeptide-1 (that doesn’t mean they don’t exist – it just means I couldn’t find one), but this is a very interesting study concerning the efficacy of Ogliopeptide-10 (PDF), which showed it to effectively stimulate collagen production without any serious side effects. Salix Alba (Willow Bark) Extract– Salicylic Acid is a beta hydroxy acid (BHA) that is often used as an acne treatment. It is a naturally occurring ingredient, usually derived from willow bark, but also occurs in other sources, such as Aloe. It’s antimicrobial, anti-inflammatory, and an exfoliant. Salicylic Acid has been shown in multiple studies to improve barrier function and collagen production. It’s best used in concentrations from 0.5% – 2%. I apply a dime-sized (or large pearl sized) amount on my face as my last skincare step in the evening, and as my second to last step in the morning (just before my sunscreen). This cream comes packaged in a small tub. I know a lot of people don’t like tub packaging because it can be unsanitary, since we’re constantly dipping our fingers into it. However, my hands are always clean when I used this product, so I really don’t mind. Still, it would be nice if it was available in a pump like the Benton Aloe Propolis Soothing Gel or the Benton Snail Bee High Content Essence. This product is unfragranced and doesn’t smell like anything. 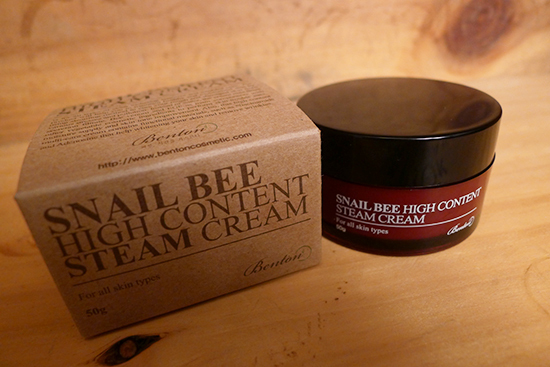 Snail Bee High Content Steam Cream has a thick, creamy, consistency that feels luxurious going on, but does not leave behind a greasy residue. My face is moisturized but matte within a few minutes of application. The first thing I noticed was that any bit of residual redness that might have been left (which isn’t much) after applying my other Benton skincare products completely disappeared with the application of this cream. Seriously – if you’re after a smooth, even, complexion with no signs of redness, this cream is a miracle worker. Over time, it visibly brightened my skin and accelerated the lightening of my post-inflammatory hyperpigmentation marks, which were already disappearing quite rapidly because of my other Benton products. I didn’t think it was possible for them to fade any faster, but they did. This cream is extremely non-irritating, and I would feel comfortable recommending it even for extremely sensitive skin. The moisture it provides is spectacular and lasting – definitely on par with Cerave Moisturizing Cream, if not more. Most importantly, this cream did not cause any breakouts, making it the first moisturizing cream in months that I am able to use without triggering a crazy acne party on my face. I’d actually planned to take some pictures of my smooth skin this morning so I could include them in this post. Unfortunately, a BB cream I’ve been testing for the past couple of days has given me a pretty nasty breakout. Thankfully, I have full confidence that it will disappear quickly thanks to my Benton products, and when it does, I’ll update this post with a photo close-up of my skin. Value: 5/5 – At $22, it’s a little more expensive than a standard drug store moisturizer, but still far less money than a department store product. When you consider that the performance of this cream is better than any other moisturizer I’ve used at any price point (and I’ve tried many! ), it’s an amazing value. I bought mine from the eBay seller, iamlove-shop, where it sells for $22 plus free shipping (direct from South Korea). There is one more way you can get your hands on this Steam Cream! I’m hosting a giveaway for the ENTIRE Benton skincare line until August 4th. It’s open internationally and easy to enter. Go check it out! I hope you love the Benton line as much as I do! The cream does have a similar consistency to the Cerave cream while it’s in the top, but I think it spreads much easier and absorbs faster. It’s still thicker than a gel based cream, though, for sure. I think you’ll really like it! If I recall correctly, you have dry skin like I do, so this cream would be perfect for you. Would this cream be suitable for oily, acne prone skin though? I don’t want to risk any breakouts, but seeing from the ingredients list, I don’t really have much to worry about. Thanks Kerry 🙂 Just ordered the whole set! I would love to know how it works for you once you’ve had a chance to try it out! You should! I think you’ll be pleased with it! Yes, I love how matte it is when it dries! Just curious – what was it that you didn’t like about it at first? This is def on my list of items to try! I ordered the snail bee masks after reading your other Benton reviews. I am so excited to try them! I keep hearing such great things about Snail products. But this cream seems to have other things as well. I have to say, I really applaud you for finding the studies linking their effectiveness!! I’m bookmarking this page because it’s been so helpful. I wish they would sell tiny packets of samples for this though. You know, I believe RubyRubyShop on Ebay does sell samples sizes of some of the Benton products – I’m not sure if this is one of them, but it might be worth looking into! Hi Marianne! I somehow missed seeing your comment until now! To answer your question (which is a great question, by the way) – the aloe gel and steam cream are both moisturizers, the steam cream being the heavier of the two. In an Asian skin care routine, all the steps are moisturizing to some degree, but there are two steps in particular that are more moisturizing than the others – the emulsion and the cream. In this case, the aloe gel is the emulsion step, and the steam cream is the cream step. The benefit of layering the moisturizers has a lot to do with the type of moisture the different products offer. It differs depending on the brands/products being used, but for the Benton, the aloe gel is a humectant, so it draws moisture into the upper layers of the skin. The moisture in the steam cream is emollient and occlusive. Occlusives provide a barrier against epidermal water loss, and they are especially beneficial when used in conjunction with a humectant. If a humectant such as aloe (or hyaluronic acid or glycerin) is used without an occlusive agent, you’ll lose all that water you’ve attracted with your humectant. If you live in a dry environment or work somewhere with man-made heating or air-conditioning, using a humectant without an occlusive agent can even be drying instead of moisturizing! Using the Benton steam cream in conjunction with the aloe gel will ensure you get the maximum amount of moisture from both products, as well as prevent epidermal water loss. I hope that information helps! Have you started using your Benton products yet? Sorry to jump in so long after this was posted. Since I have oily skin, I usually use only an emulsion, but based on what you are saying maybe that is incorrect? This cream I love especially because it manages to quench my dry skin completely without making those acne patches irritated (and in fact, soothes them), whereas before I have to reapply lighter moisturizers throughout the day and still have to worry about it inflaming the acne. Anyway, just thanks again for your blog, otherwise I would have never tried it. p.s. I am just slightly concerned as to the process of extracting the snail goo from the snails (in terms of cruelty) though! I’ve often wondered about the process of extracting the snail goo myself. My understanding is the farms tout themselves as very humane – the snails are fed a diet of fresh ginseng, and they are not killed in order to harvest the mucin. However, I’m unclear on how the harvest actually happens. The most detail I’ve been able to find about it thus far is that they are exposed to “safe mechanical stress” multiple times throughout their lifecycle. I wish I knew more about how the “safe mechanical stress” worked! After reading your review i ordered the essence and the cream 3 weeks ago from ebay, hopefully it will be arriving soon. I hope it works well for my oily and acne prone skin. I am currently going crazy over korean skincare products. This will be my first product to try. Gonna try Tomatox mask too. I have a lot of acne scars. I hope this product exceeds my expectation. Thanks KERRY for your review and before and after pictures. Thanks, i definitely will give u an update after i use it for few days. Laura again! So I’ve been using this for a couple of weeks aaaand, I dunno. I have come to realize that I just dislike the heavy, thick, cream consistency that this cream and the CeraVe one has. Do you have any recs for a good, lighter weight, night cream that has worked for you? Aw man, I wish I did! I generally gravitate toward the thicker cream consistencies myself, so I haven’t tried a whole lot of lighter ones. The lightest one I’ve tried and liked was the Missha Super Aqua Cell Renew Snail Gel. If you find one you like, I would love to hear about it! hi I’m not Kerry, but if you are interested in a more light weight, gel texture but still moisturize well, then I recommend Cerave PM. I’m using it right now, after I finished my benton steam cream sample. TBH, i miss the silky texture, rich and heavy consistency of the steam cream. The Cerave PM is a lot lighter, sink in much faster and very matte. It has niacinamide, ceramides and hyaluronic acids. i’m using Benton series as well since i read it on your site. I would like to ask, do you use Benton essence/gel/steam cream on your neck as well? if not, what product do you use for your neck? Kerry, thanks for your reply. would like to ask one more question, since i cant find out on your daily regime skin care. What product do you use for eye skin care? any recommendation for wrinkle around eye? I can’t wait for their cleanser and sunscreen to be released! I will literally be the happiest girl alive! I’ve already stocked up on my second bottles of the toner and essence, literally all I’ve been using and there’s a drastic improvement in my skin. It went from being oily, red, and full of acne to becoming really soft and blemish free. They really weren’t kidding when they said suitable for all types of skin! That’s such great news, Lily! I’m right there with you – I can’t wait to try all of Benton’s future products! Great review – I just searched for info on this product since my usual Korean skin care supplier is having a sale on Benton (30% off by the way; if anyone is interested it’s http://www.roseroseshop.com/en). Anyway, thank you Kerry for explaining every single ingredient. I normally have to do this myself because I am obsessive about using safe/mostly natural products and many reviewers simply give a general overview or leave readers to do the research themselves. Your explanations and the links to actual scientific reviews are perfect, and I will totally keep checking your site based on that throroughness. I’m glad to hear this was such a winner for you as well. I’ve been looking for a gentle but highly moisturizing cream, but most either end up sticky or don’t do enough during the harsh winter weather. This sounds like a perfect fit and you’ve sold me on it. Thanks again! I wanted to pick your brain for a minute since you’re so knowledgeable on ingredients. I adore the Benton Snail Bee Essence and have been using it daily for months. I just recently picked up the Steam Cream and it’s causing breakouts. I’m sure it’s the Steam Cream as I’m testing it and only using it infrequently. Any thoughts on what ingredient might be causing this? I’m so sad because I LOVE the essence and I really wanted this to work for me. I may switch to using it as an eye cream as it didn’t affect that area at all. Thanks again for such an informative blog. I really enjoy your very detailed reviews! Hey Angel! That’s such a bummer about the Steam Cream! I’m not sure what’s causing it, but if I had to venture a guess? I would guess it’s possible it’s the Cetearyl Olivate. I know that olive oil can be comedogenic for some people, and Cetearyl Olivate derives it’s fatty acid from it. Do you know if you’ve ever had issues with olive oil before? Sorry for the super late reply, and thanks for your thoughts. I don’t think I’ve ever had a problem with olive oil. I used to use it in my DIY cleansing oil with no issues. But perhaps this is different as it’s really absorbing into my skin and not being rinsed away. I’m going to experiment a bit more with straight olive oil just to see. You have me curious 🙂 Have a very happy holiday season!! Hi Grace! I think the Essence is the most effective of the three. What moisturizer are you currently using? 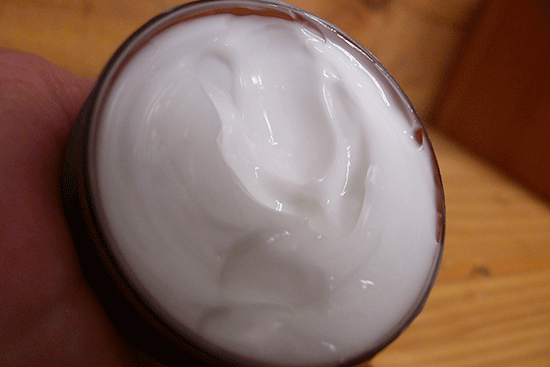 Do you remember any of the specific moisturizers that have broken you out in the past? At the moment I’m using one recommended by my aesthetician called Dr. Eckstein Azulen Balsam (facial balm/ moisturizer). It’s a German brand that (apparently) specializes in skincare for sensitive skin and while it is quite good at soothing my crazy reactive skin, it doesn’t do much for my acne (other than calming down the redness). I do love their products especially their spot treatment, but Benton is fast becoming my top favorite 😀 The last moisturizer that broke me out was probably one from Aveeno (can’t quite remember the name of it). Hi Kerry! I’ve also purchased the entire Benton line (all minus the gel!) from W2Beauty because of your fabulous reviews of all of the products. Thank you so much for going into detail about ingredients, your experience, and even providing pictures and answering questions (your skin looks so good btw!). I’ve been using it for a few days now, and I haven’t seen too much of an effect yet, but the products certainly feel good and haven’t caused any adverse reactions, so I’m extremely hopeful! I wanted to ask you about incorporating another product into the Benton routine. I was using Hadalabo’s Gokujyn Hyaluronic Acid before starting Benton and I really liked the results I had with it! I was wondering if it would be okay to use it in addition to the Benton toner (two toners?! ), and if so, whether I should use it before or after the Benton toner (or somewhere else in my routine)? Thank you for sharing your expertise!! Hi Jackie! Like you, I have been using Hadalabo’s Gokujyun HA Lotion for years before discovering Benton from this site and been only using it for less than a month now. What I do is I use Hadalabo as my toner in the morning and the Benton toner in the evening because of its BHA. One time, I just felt like doing, “what the heck, I’ll mix them instead, ” so I combined the two toners 50/50 in my morning routine. 😀 No complaints. so far. Would you recommend the Benton range for a men? Hi Cyril! I would absolutely recommend Benton for men. In fact, this range is specifically designed to be unisex, and because there is no added fragrance, it;s not going to smell like flowers and strawberries. I don’t think it’s necessary to stick to one range – it’s just a matter of personal preference. The Snail Bee Skin and Snail Bee Lotion are both brand new products, so I’ve only been using them for a short while. The Aloe BHA Toner is different from the Snail Bee Skin, and the Snail Bee Lotion is very different from the Aloe Propolis Gel. I would personally go for the special set that includes the aloe products – I personally still prefer a mix of Aloe and Snail Bee in my skin care routine. I hope that helps! I would love to know what you decide to get! Love your review. Thank you, i just applied the cream last night for the first time, amazing how it glides on my face. One question (or two), how long you usually wait a product to be absorbed between each step in your daily skin care regime? Especially how long you have to wait to apply the Benton Cream after the Argan Oil? one question: does the cream absorb quickly into the skin? i’m always in a rush in the morning and it’s inconvenient to have to wait before applying makeup. Hey! I recently purchased this steam cream along with the aloe toner, gel cream, and snail bee essence (per all of your suggestions!) but I have a question. Is the steam cream okay to use in the daytime? 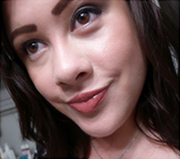 I am wary about putting makeup over such a creamy moisturizer. Also, can I still use a sleeping pack on top of it at night or is that overkill? Hi Ashley! I like using it in the daytime, but my sister doesn’t. It’s really just matter of personal preference. After scouring the internet for an alternative to my La Mer Gel Moisturizer- and a cystic acne breakout trying mizon snail cream- I stumbled on your Benton reviews. After some more research, I ordered the full Snail Bee line plus the Aloe Toner and Gel. I wanted options, so if one toner or essence/gel caused a reaction I could swap out and try the other. I’m only on day 2, and I have some unrelated breakouts, but I’m hopeful. I was wary of trying some of these because of a suspected sensitivity to salicylic acid that plagued me for years. However, at the time I was having reactions to it, I also smoked. When I quit smoking two years, my breakouts all but disappeared. I was left with only hormonal or acidic food acne. Maybe smoking was responsible. When I noticed willow bark as an ingredient, I was worried. Maybe this formulation will be better for me. I’ll let you know in a few weeks if I react to this cream, because the only possible acne trigger I see here is the willow bark. Perhaps people breaking out from this might discover that salicylic acid is a trigger. If I don’t break out, then a whole new world previously closed to me will open up, and I won’t need to avoid salicylic acid like the plague. Hi Kerry! I’ve just noticed that the steam cream has a new packaging and it comes in a tube now. It seems like there is a slight change in the ingredients as well. I was just wondering if you’ve had a chance to try it yet? I’m just a bit worried because I’ve been using the essence and steam cream and although my acne is far from gone yet I think I’m starting to see some changes. I’m looking into getting the rest of the products from Benton. Hello,dear! First of all,i must congratulate you for the very detailed and useful blog. Because of you 🙂 😛 i started using Benton products and i am so happy i did it! My face is clean and smooth and per all much better. Still,i have a question: can a niacinamide product be layered over a AHA/BHA toner? i’ve read that this combination changes niacinamide into another thing(forgot the name of it…next purchase-Gingo Biloba!). So,is this available for Benton Aloe Toner or any other toner of this kind? I order my first batch of the BHA toner from W2 beauty and it said Oct 2014 on the bottle, the contents are clear and my skin is fine. Can I use it in the morning? Is it recommended? I’m not sure if anyone else has experienced this but I have had a reaction twice before when I was stung by a wasp so I was iffy about trying this. The first few times my face turned red but the redness was gone by morning and I still feel what I’d call a slight burning or tingling feeling when I use this and some redness. It works though. My pug scratched my face while playing and I put this on it after I gave that area a rest for a day or two and I was amazed at how much it healed over night. Hi, am russy .. can i use foundation or bb cream after using benton steam cream.? Thanks ? Hi! I’m looking for some moisturizer for my sensitive, acne-prone skin and this seems perfect! A question though, I do have some whiteheads and I am avoiding fatty alcohols because many said that it may be the reason for whiteheads. I realized you mentioned that too in the post your wrote. My question is that, the product contains Behenyl Alcohol, does it also counts as fatty alcohol though?